Weekend Immersion Seminars: These seminars are for the Yang Family Style enthusiasts! These weekend immersion experiences will focus on the Yang Family Style of T’ai Chi Ch’uan as taught by the 4th Generation Yang Family Descendant Grand Master Yang Zhenduo to Horacio Lopez between 1990 and 2006. These Immersion Seminars are organized for: * Individuals and groups who have previously studied the Yang Family System which includes: Hand Forms, Sword, Saber, Staff and Push Hands. * Students/enthusiasts who may have learned some form of ‘Yang Style’ and would like to be exposed to and/or learn what the Yang Family members actually teach and call Yang Family Style. This is a great opportunity to refine your T’ai Chi Ch’uan practice and understanding. Also, these weekend seminars will be helpful for the many people who can not attend classes during weekdays, on a regular basis. Dates - Times/Format: Three hours Instruction on Saturday afternoon. Call or write for more information. These seminars are for the Yang Family Style enthusiasts! These weekend immersion experiences will focus on the Yang Family Style of T’ai Chi Ch’uan as taught by the 4th Generation Yang Family Descendant Grand Master Yang Zhenduo to Horacio Lopez between 1990 and 2006. * Individuals and groups who have previously studied the Yang Family System which includes: Hand Forms, Sword, Saber, Staff and Push Hands. * Students/enthusiasts who may have learned some form of ‘Yang Style’ and would like to be exposed to and/or learn what the Yang Family members actually teach and call Yang Family Style. This is a great opportunity to refine your T’ai Chi Ch’uan practice and understanding. Also, these weekend seminars will be helpful for the many people who can not attend classes during weekdays, on a regular basis. Three hours Instruction on Saturday afternoon. 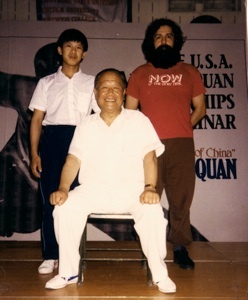 1990 - Horacio with Grand Master Yang Zhenduo and Master Yang Jun, Virginia. 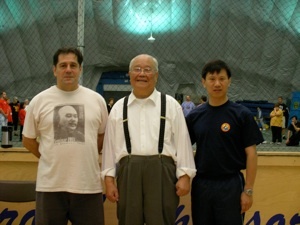 2006 - Thunder Bay, Ontario, Canada; at First International Forum on Taijiquan.